This exciting opportunity will involve an introduction to the Red Devils Team followed by a thorough training session on the ground. 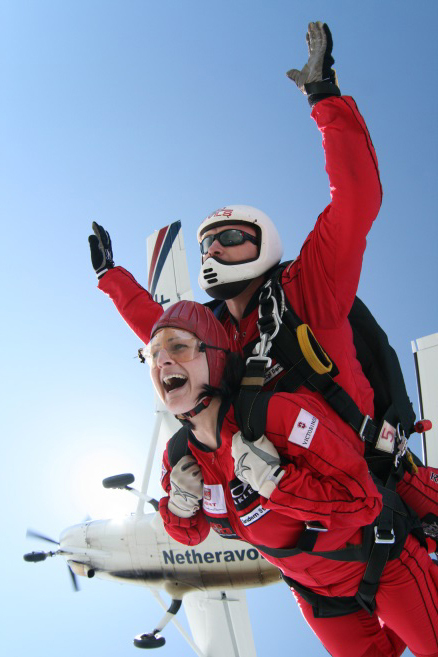 When you are fully briefed and it is your turn to jump you will board the aircraft with your Red Devils tandem instructor, once aboard you will be attached to your instructor in readiness for the jump. The aircraft will take off and climb to 13,000ft (2 1/2 miles up! ), during the climb you will be able to see stunning aerial views from a unique perspective. At exit altitude you move to the door of the aircraft and on the count of 3 jump out into free-fall. For some people the next 45 seconds lasts forever, for others it is over in the blink of an eye. However it takes you, your instructor will deploy the parachute at approximately 6,000ft for the canopy ride to the ground.